Fish hard and relax in comfort on the North Platte River. After a great day of Wyoming fly fishing, come home to one of our modern cottages or hook up to one of our RV sites located within a few steps of The Reef Fly Shop. Not only do we provide guests with premium guides and gear, we also have 17 miles of private fishing access for patrons of both the Reef Fly Shop and North Platte Lodge—something no other North Platte River outfitter offers. Just a few steps from Grey Reef, our location gives us a commanding view of the fishery as well as real-time access to conditions. Connect with The Reef Fly Shop for the most current, and relevant, North Platte fishing reports. Wyoming fly fishing at its best. Here, location translates to convenience. The Reef Fly Shop is the only dedicated fly fishing one-stop stationed within spitting distance of the river. That proximity makes gearing up for your day on Grey Reef easy. In addition, our expert guides and pointed, honed selection of high-end tackle, including proven flies, make your day that much more productive. The Grey Reef ecosystem, and its abundant bug life and consistent water temperatures, make it second to none for Wyoming fly fishing through four seasons. In other words, this is the place to target large, healthy trout in good numbers—any time. The scenery is hard to beat, too. Wyoming is one of the last true “Western” states. Vast expanses of wilderness and more trout per mile than people make Wyoming’s Grey Reef an ideal place to escape everyday life. 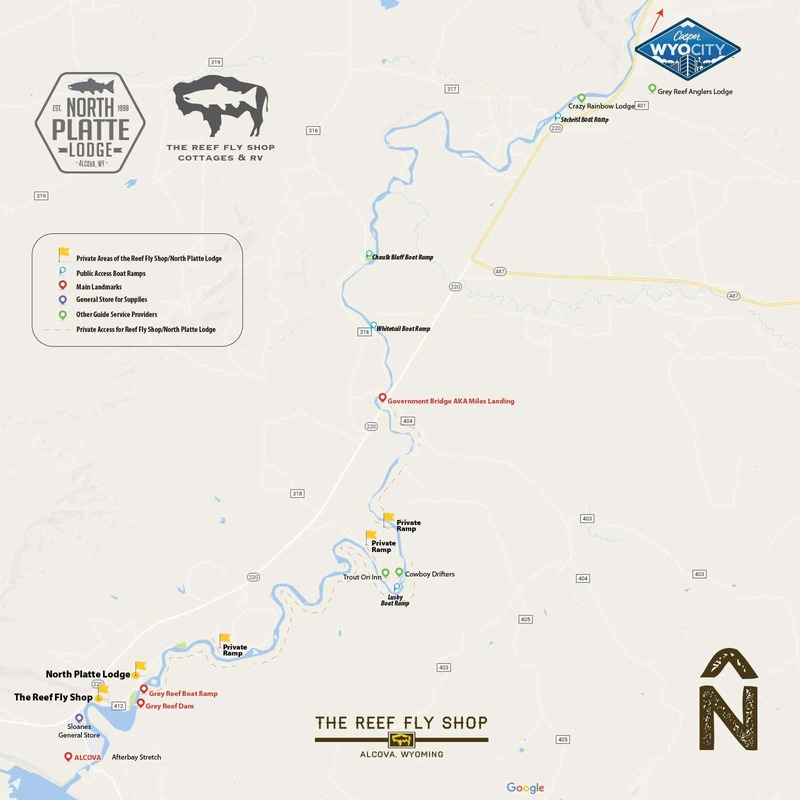 The Reef Fly Shop is owned and operated by the same two families who run the highly regarded North Platte Lodge, which has been hosting Wyoming fly fishing and wing shooting guests since 1998. That experience resonates in a North Platte River guide staff that raises the bar when it comes to combined expertise on river stretches such as the Miracle Mile, Fremont Canyon, and Grey Reef. Our guides will help you find the best spots, successfully fish the premier hatches, and catch some trophy-worthy trout in the process. More than that, it’s their everyday goal to provide an overall fly fishing experience you won’t soon forget in one of the country’s best trout fishing areas. And that’s no exaggeration. Check out our Galleries for proof. Quality products, a knowledgeable guide staff, the freshest North Platte fly fishing report, and a great location allow The Reef Fly Shop to fully prepare you for an unforgettable day on the water. Call and book your trip to fly fish the North Platte today! Private access is a rare commodity in Wyoming and this is what our North Platte River fly shop and North Platte Lodge provide exclusively for our guided fly fishing guests. In Wyoming, the water is public domain, but the land underneath belongs to the private landowner. 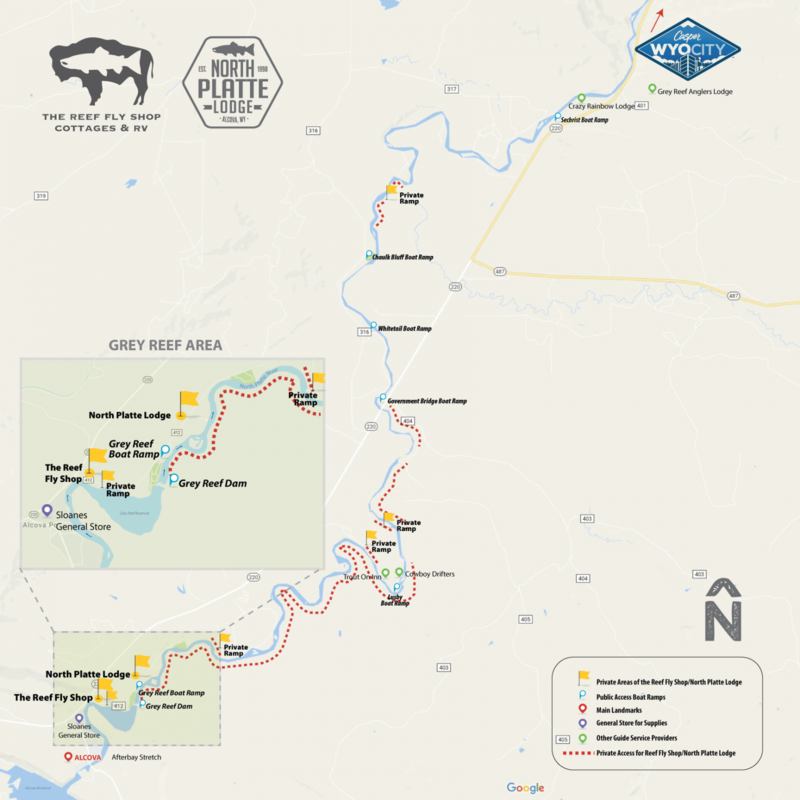 The Grey Reef section of the North Platte River is mostly private, but with our fly fishing guides you can fully experience Upper Grey Reef, where we have 17 miles of private access and 3 private boat ramps. Click the image below for a much larger version. Do you want to trophy hunt in Wyoming?